Xinjiang cuisine (Chinese: 新疆菜; pinyin: Xīnjiāng Cài) reflects the cooking styles of many ethnic groups of the Xinjiang region, and refers particularly to Uyghur cuisine (Uyghur: ئۇيغۇر تائاملىرى, Уйғур Таамлири‎, ULY: Uyghur Taamliri; Chinese: 维吾尔菜; pinyin: Wéiwú'ěr Cài). Signature ingredients include roasted mutton, kebabs, roasted fish, and rice. Because of the Muslim population, the food is predominantly halal. Xinjiang cuisine is found throughout much of China, as migrants from the region often open Xinjiang restaurants or food stands in other regions. The Herembagh (Uyghur: ھەرەمباغ‎, Һәрәмбағ; Chinese: 海尔巴格; pinyin: Hǎi'ěr bā gé) franchise serves Uyghur cuisine. Ethnic groups in Xinjiang generally have different cooking and eating methods. Han people in Xinjiang use chopsticks, while Kazakhs eat with their hands. Ceremonial foods for certain groups include horse milk (kymyz) for the Kyrgyz and sheep entrails for the Sibe. The dishes of the Dongxiangs are prominent in Xinjiang-style restaurants. Signature Dongxiang dishes include noodles boiled in a thick mutton soup and steamed twisted rolls. The Uyghurs form a large part of the population of Xinjiang, their food therefore dominated the region. Uyghur food is characterized by mutton, beef, camel (solely bactrian), chicken, goose, carrots, tomatoes, onions, peppers, eggplant, celery, various dairy foods, and fruits. A Uyghur-style breakfast is tea with home-baked bread, smetana, olives, honey, raisins, and almonds. Uyghurs like to treat guests with tea, nan, and fruit before the main dishes are ready. Most Uyghur foods are eaten with chopsticks, a custom that was adopted from Han Chinese culture in the 19th century. Many Uyghur dishes are also found among other ethnic groups in Central Asia, and their food also shows Chinese influence. A common Uyghur dish is laghman or leghmen (لەڭمەن, ләғмән; Shou La Mian, 手拉面, shǒu lāmiàn, شِوْ لامِيًا), a noodle dish thought to have originated from the Chinese lamian – it has been noted that words that begin with L are not native to Turkic, therefore "läghmän" is possibly a loanword from Chinese. However, the flavor and preparation method of leghmen are distinctively Uyghur. It is a special type of handmade noodle, made from flour, water, and salt. The dough is divided into small balls and then stretched by hand. The noodles are boiled until very soft and then served topped with stir-fried meat and vegetables (bell peppers, chili peppers, cabbage, onions, and tomatoes) in meat stock. Another typical Uyghur dish is polu (پولۇ, полу; 抓饭, zhuāfàn, جُوَ فًا), a dish found throughout Central Asia. In a common version of the Uyghur polu, carrots and mutton (or chicken) are first fried in oil with onion, then rice and water are added, and the whole dish is steamed. Raisins and dried apricots may also be added. 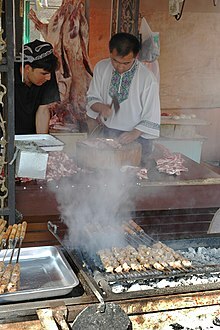 Other dishes include soups made from lamb or chicken, and Kawaplar (Uyghur: كاۋاپلار, каваплар) (kebabs) made from lamb or beef. Kawaplar is seasoned with chili powder, salt, black pepper, and cumin are eaten with the skewer parallel to the mouth, gripping the kebab closest to the end with one's teeth and sliding it off the pointed edge into one's mouth. The bread commonly found in the Central Asia is a baked flatbread known as nan (نان, нан; 馕, náng, نْا), using sesame seeds, butter, milk, vegetable oil, salt, and sugar. Girde (Гирде) is also popular; it is a bagel-like bread with a hard and crispy crust. Sangza (ساڭزا, Саңза; 馓子, Sǎnzi, صًا ذِ) are crispy fried wheat flour dough twists, a holiday specialty. Samsa (Uyghur: سامسا, Самса‎; Chinese: 烤包子; pinyin: kǎo bāozi, كَوْ بَوْ ذِ; literally: baked buns) are lamb pies baked using a special brick oven. Yutaza (يۇتازا, Ютаза; 油塔子, yóutiáozi, يِوْتِيَوْ ذِ) is steamed multi-layer bread. Göshnan (گۆشنان, Гөшнан; 馕包肉, náng bāo ròu, نْا بَوْ ژِوْ) are pan-grilled lamb pies. Pamirdin are baked pies with lamb, carrots, and onions stuffed inside. Shorpa is lamb soup (شورپا, Шорпа; 羊汤, yáng tāng, يْا تْا). Other dishes include Toghach (a type of tandoor bread) and Tunurkawab (馕坑肉, náng kēng ròu, نْا كعْ ژِوْ). A popular Xinjiang dish is dapanji (大盘鸡, dàpánjī, دَاپًا کِ, chong texse toxu qorumis, чоң тәхсә тоху қорумиси), which is literally translated as "big plate chicken." It is a spicy hot chicken stew served on a big plate, and after the chicken has been eaten, wide flat hand-pulled noodles are added to the gravy. The dish gained popularity in the mid-to-late 1990s, and is said to have been invented in Shawan, northern Xinjiang by a migrant from Sichuan, who mixed hot chili peppers with chicken and potatoes in an attempt to reproduce a Sichuan taste. Beverages include Chinese black tea, kvass (格瓦斯, gé wǎsī, قْ وَصِ, квасс; a non-alcoholic drink made from honey), and other bottled drinks available in other areas of China. Another common beverage is the locally produced Xinjiang black beer, known to be stronger in flavor than other local Chinese beers. It is shipped throughout China. Grapes are grown in the Xinjiang region, which are used for wine production and other grape products. In Turfan, wine is an important part of the local economy and was known in the Tang dynasty. The wine, called museles, is commonly made and used by the locals, and is also produced commercially for export outside the region. While it is different from Middle Eastern phyllo dough made baklava, the same appellation is used for Uyghur nut cake. Dates, raisins, walnuts, and syrups are the ingredients of the nut cake. ^ "Xinjiang Cuisine". All-China Women's Federation. 2006-04-10. Archived from the original on September 1, 2009. Retrieved 2010-11-24. ^ Byler, Darren (October 31, 2015). "The Uyghur Restaurant Chain Herembağ comes to America". beigewind.wordpress.com - the art of life in Chinese central Asia. ^ Beige Wind (November 19, 2015) [10:00 am]. "Dispatches from Xinjiang: Uyghur Restaurant Eden Arrives in America to Mixed Reviews". Beijing Cream: A Dollop of China. ^ Dana, Leo-Paul, ed. (2010). Entrepreneurship and Religion. Edward Elgar Publishing. pp. 287–288. ISBN 978-1-84720-572-8. ^ Zhuang, Kongshao (2002). "The Development of Ethnic Cuisine in Beijing". In Cheung, Sidney C.H. (ed.). The Globalization of Chinese Food. University of Hawaii Press. pp. 75–77. ISBN 978-0-8248-2582-9. ^ Bellér-Hann, Ildikó (2002). "Temperamental Neighbours: Uighur-Han Relations in Xinjiang, Northwest China". In Schlee, Günther (ed.). Imagined Differences: Hatred and the Construction of Identity. LIT Verlag Münster. p. 76. ^ a b M Cristina Cesàro (2007). "Chapter 10, Polo, läghmän, So Säy: Situating Uyghur Food Between Central Asia and China". Situating the Uyghurs between China and Central Asia. Ashgate Publishing, Ltd. pp. 190–192. ISBN 0-7546-7041-4. Retrieved 2010-07-30. ^ Martine Robbeets (24 July 2015). Diachrony of Verb Morphology: Japanese and the Transeurasian Languages. De Gruyter. pp. 224–. ISBN 978-3-11-039994-3. ^ Fuchs Christian; Lars Johanson; Éva Ágnes Csató Johanson (29 April 2015). The Turkic Languages. Routledge. pp. 204–. ISBN 978-1-136-82527-9. ^ Mark Janse; Sijmen Tol (1 January 2003). Language Death and Language Maintenance: Theoretical, Practical and Descriptive Approaches. John Benjamins Publishing. pp. 93–. ISBN 90-272-4752-8. ^ Ildikó Bellér-Hann (2007). Situating the Uyghurs Between China and Central Asia. Ashgate Publishing, Ltd. pp. 192–193. ISBN 978-0-7546-7041-4. ^ M Cristina Cesàro (2007). "Chapter 10, Polo, läghmän, So Säy: Situating Uyghur Food Between Central Asia and China". Situating the Uyghurs between China and Central Asia. Ashgate Publishing, Ltd. pp. 197–198. ISBN 0-7546-7041-4. Retrieved 2010-07-30. ^ Abdurishid Yakup (2005). The Turfan Dialect of Uyghur. Harrassowitz. p. 161. ISBN 978-3447052337. ^ "Grapes of Wrath: Muslim wine ferments divisions in China". AFP. Daily Mail. 4 June 2015. ^ Zhang, Liping (Nov 22, 2016). "Uyghur Entrepreneur Fights Prejudice One Nut Cake at a Time". SIXTH TONE. ^ Dou, Eva (Oct 31, 2016). "Alibaba's Flying Pig Travel Service Becomes Ethnic Flashpoint in China". The Wall Street Journal. ^ "Xinjiang entrepreneur donates 5 tons of nut cakes to quake relief efforts". English.news.cn. 2014-08-09.